The 2005 Energy Tax Incentives Act provides immediate tax deductions for qualifying investments that reduce energy costs for commercial buildings on a whole building basis, or for qualifying lighting1, HVAC (Heating, Ventilating and Air Conditioning)2 or building envelope capital additions3. (Code Sec 179 (c)(1)(D)). The maximum $1.80 per square foot deduction requires a 50% energy cost reduction after comparing to a referenced 2001 building4. On June 2nd, 2006, IRS published, Notice 2006-52, which provides guidance on how the commercial building energy tax incentives work. In general, the guidance is more favorable than many people had anticipated and it divides the 50% overall energy cost requirement into three 16.67% thresholds. To obtain the new deductions, the new capital investment has to achieve the 16.67% performance increase by comparing performance based on 2001 ASHRAE (American Society of Heating, Refrigeration and Air Conditioning Engineers) standards for Lighting, HVAC and Building Envelope. To verify the 16.67% energy cost improvement, taxpayers must utilize an approved software model. Modern building lighting installations function as a system comprised of the basic lighting fixtures and lighting controls. Lighting controls use the time of day and sensors to detect occupants as decision points for shutting off lighting. More sophisticated controls can measure the amount of sunlight to manage energy use by reducing building lighting when natural light is available. Lighting controls are essentially the brains of a lighting system. EPAct incentivizes the installation of both improved Lighting and lighting controls. The Interim Lighting Rules are very flexible and, in energy, provide tax deductions for as little as 25% improvements in lighting performance. The Interim Lighting Rules are the only provisions that base the new deductions on product specifications rather than energy cost reductions. HVAC is recognized as the largest electrical category and the DOE estimates that it consumes 50% of all building energy. Heating systems generally have the same core systems and are distinguished by fuel sources. Accordingly, furnaces are characterized by type such as oil, gas, propane or electrical. Ventilation systems are very important for both energy management and air quality. Ventilation systems can use the natural outside environment for both heating and cooling purposes. Air conditioners are major electricity users. Thus, installing improved air conditioning technology can substantially reduce electricity consumption. Notice 2006-52 repeatedly uses the word, cooling, in reference to air conditioners. HVAC systems require a lot of motors. Motors consume a lot of energy. Motors are used in chillers, air handling units, cooling towers, boilers, pumps and fans. One widely used technology to reduce motor energy usage is to incorporate variable speed drives (VSD) or variable frequency drives (VFS) for all major motors. VSD’s electronically reduce motor speed to correspond to need and electrical load. Like lighting, HVAC controls discern occupants and utilize the time of day to manage electrical, and hence, energy use. 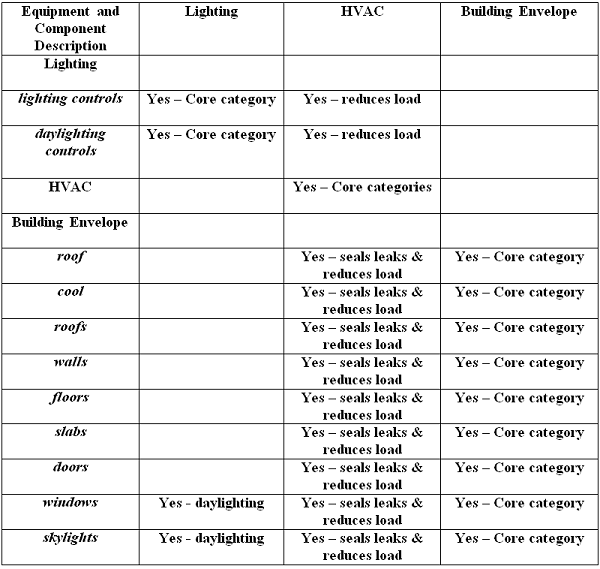 Vendors of air conditioning control systems emphasize that it is more cost effective to install Lighting Controls as a subset of HVAC controls when HVAC controls are already specified. Combined Lighting and HVAC controls and more advanced systems are called Building Management Systems (BMS). The more equipment and components connected to HVAC controls, the greater the potential energy savings. Building envelope describes all of the perimeter surfaces of a building that touch the outside, including roofs, slab, walls, windows and doors. Roofs, slabs and walls utilize insulation to maintain heating and cooling loads. Increasingly more sun intense jurisdictions are requiring so called “cool roofs” that reflect, rather than absorb, sun and heat. Windows use glazing and solar shades to maintain heating and cooling loads. Doors can also use glazing. Walls can incorporate vapor barrier and moisture systems that enable a building to use energy efficiently. Skylights, particularly with large retail buildings, distribution centers and warehouses, can substantially reduce the need for conventional lighting and the related electrical use. Under California’s building energy codes, certain large footprint buildings are required to have skylights. EPAct provides that whole buildings that achieve 50% energy cost reductions compared to that of ASHRAE 2001, qualify for the maximum $1.80 per square foot deduction. With the whole building approach, the goal is to maximize the integrated design of all systems and components to minimize energy use. In particular a highly insulated air leak free building envelope can maximize the efficiency of HVAC systems. Energy oriented window systems enhance HVAC improvements and when Lighting and skylights and Windows are functionally integrated, the result is commonly called a daylighting system. Exhibit A presents a diagram illustrating how the three core building components integrate to save energy. The optimal approach to energy tax planning is to correlate the building energy tax plan to the organization’s overall building energy plan. Just as all buildings are unique, every enterprise’s approach to building energy planning is going to be unique. For large building portfolios, the enterprise building energy strategy generally reflects the building owner’s overall facts, circumstances and long term objectives. Financial Resources – At the threshold, energy improvements are expensive. Sophisticated building owners use a myriad of investment incentives, electricity rebates and tax incentives, coupled with the underlying energy cost reduction, to substantially improve the economic payback related to energy improvement investments. Geography – Different regions of the United States present different energy cost exposures and opportunities. For example, in the North, heating comprises a substantial portion of energy costs. In the Northeast, there tends to be a higher proportion of older, and hence, less energy efficient buildings. However, there are always exceptions, including multiple buildings built recently in New York and Boston that are designed to achieve very high efficiency levels. In the southern region of the country, air-conditioning results in the disproportionate amount of energy costs. However, many southern and western buildings in the United States are relatively new and energy efficient which acts to mitigate some of the higher cooling costs. The underlying costs of energy, particularly electrical energy can vary widely depending on the local utility rate environment. Some state’s utilities do not have enough local generation capacity and are obligated to pay market prices to obtain electricity from third parties. Other utilities may have adequate power facilities, but may be hamstrung by prior contractual arrangements made in the newly deregulated electricity market place. Building owners with tenants are more motivated to make investments reducing operating costs including energy costs in soft real-estate market. Increasingly more people are concerned with energy management as one of the components of environmental sustainability concerns particularly in the effort to reduce emissions. Building energy code standards vary widely in the United States. Some twenty-two states utilize ASHRAE 2004 standards that require energy efficiency. Most of the remaining states use prior standards such as ASHRAE 2001, ASHRAE 1999 or even older codes that incorporate less demanding energy standards. California utilizes building code provisions called, Title 24, which particularly emphasize energy efficiency. ASHRAE 2004 has specific standards requiring Lighting and HVAC to be more energy efficient. More efficient Lighting is specified for a wide variety of building categories including offices, warehouses, manufacturing facilities and schools. Recognizing the high energy costs relative to air conditioning, ASHRAE 2004 now requires off hours HVAC to shut down controls for 15,000 BTU units and above which is a substantial drop from the previous 65,000 BTU units and above requirement. The long term reach goal promulgated by the U.S. department of energy is to achieve ZEB. ZEB stands for Zero Energy Based buildings where the net of the energy generated at the building and utilized by the building from the electric grid is zero. Buildings generate energy from building systems that create energy. Energy can arise from conventional systems such as co-generation and a variety of generators all from alternative sources, such as solar, wind or geothermal. Building owners on the road to ZEB are going to proceed along a path that works best for them. The EPAct tax provisions reward tax payers for improving conventional systems while simultaneously encourage the conversion to alternative energy sources. A hypothetical ZEB strategy and the related tax opportunities based on today’s technology expectations is presented in Exhibit B. * The road to ZEB concept is a hypothetical plan developed by Energy Tax Savers, Inc.
Tax advisors that understand a building owner’s long term energy strategy have the opportunity to provide important advice for supporting that strategy. With today’s’ high energy prices, reducing energy can substantially reduce building operating costs. The new EPAct Commercial Building tax deductions provide additional cost savings.